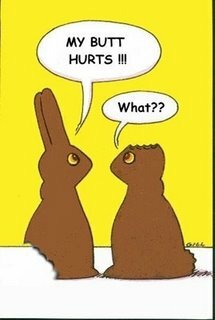 So, Happy Easter. I love Easter. Always have.. good things always happened to me on Easter. My parents always bought me a stuffed animal and there's always the chocolate. I tried finding my picture of me hugging the Easter bunny to put up, but it turns out I hadn't scanned it when I was going through all my old childhood photos. Which is probably a good thing, as I was probably a little too old and enthusiastic, and to have photographic evidence.. anyway. Today I ate too many Cadbury creme eggs and Terry's chocolate oranges until I felt ill and watched far too many episodes of the new season of 24. All I can is wow.